The RP Photonics Buyer's Guide contains 46 suppliers for fiber patch cables. Fiber patch cables, also called fiber-optic patch cords, are cables typically containing one or two optical fibers, which are equipped with standardized fiber connectors on both ends. They are generally sold in large quantities, rather than custom-made, although quite special models are also available. Typically, the used fiber cables have some additional mechanical protection for the fiber(s), e.g. some aramid yarns surrounded by a polymer jacket. The outer diameter is usually several millimeters, i.e., far more than the diameter of the contained fiber, which is e.g. 125 μm. There are also armored fiber cables containing stainless steel tubes. 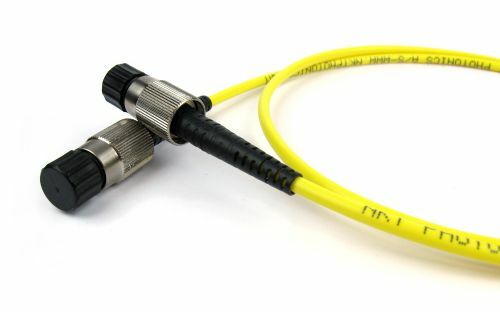 Figure 1: A fiber connector at the end of a fiber patch cable. The photograph has been kindly provided by NKT Photonics. They are convenient e.g. for connecting devices in the context of optical fiber communications including applications like cable TV (CATV) – mostly inside buildings, e.g. in fiber to the home installations. They are used in computer networks (LANs = local area networks) with optical transmission for higher data rates (e.g. 10 Gbit/s). They are also widely used in optical laboratories, e.g. 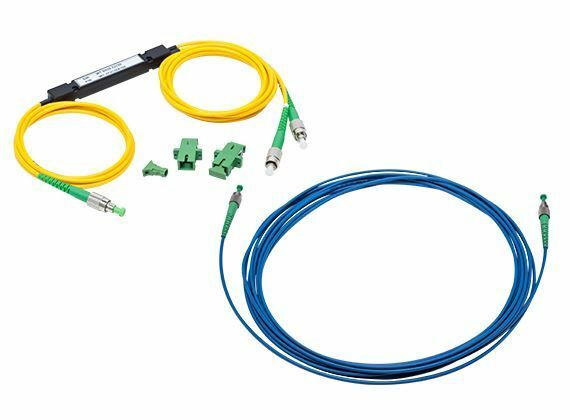 for transmitting light from a fiber-coupled light source to a measurement setup, or from there to a spectrometer, and for fiber-optic sensor systems. Special versions are available for unusual wavelength regions, e.g. patch cords with mid-infrared fibers. 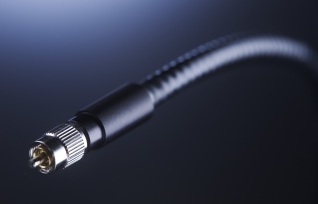 In homes, TOSLINK fiber cables can transport digital sound signals. A typical length of a fiber patch cable is between 0.5 m and a few meters, but cables with dozens of meters or more are also available. The actual fiber is usually a glass fiber and sometimes (e.g. for consumer-grade TOSLINK cables) a plastic optical fiber (polymer fiber). 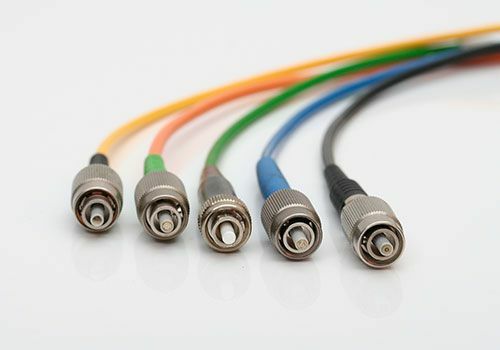 Fiber patch cables are available with a very wide range of fiber connectors; see the corresponding article for an overview on connector types. They can be different types of fiber connectors on the ends, e.g. LC on one end and ST on the other end. Although some fiber cables can carry extremely high optical powers (e.g. several kilowatts), patch cables are limited to much lower powers – typically a most a few watts, as is sufficient e.g. for telecom applications. Patch cables can contain different types of optical fiber, e.g. single-mode or multimode telecom fibers – even various specialty fibers. The color of the cable often indicates the type of transmission medium – for example, yellow cables with blue connectors containing single-mode fibers, and orange or gray fibers with black connectors for multimode fibers. Some fiber cables are called “bend-insensitive”, which more precisely means that the used fibers have reduced bend losses for a given bend radius, and a reduced critical bend radius. Duplex patch cables contain two fibers. Their connectors can have two fiber connections; alternatively, there can be two connectors on each side.